Dubai Sep 14 (IANS) The spotlight will on the India-Pakistan rivalry when the six-nation Asia Cup cricket tournament begins here on Saturday. India are the most successful team in the Asia Cup having won six of the 13 editions of the tournament. But this time it will be an uphill task for the Indian players as they will miss the services of regular skipper Virat Kohli. But on the pitches of Dubai where the spinners will get turn leg-spinner Yuzvendra Chahal and chinaman Kuldeep Yadav should be a handful. Kedar Jadhav who is also making his comeback to the side could also support the spinning duo if the situation demands. Pakistan meanwhile have won the tournament twice. The first time in 2000 when they beat Sri Lanka in the final and then in 2012. Fakhar Zaman with his disciplined batting is capable of turning a match with the support of Babar Azam Imam-ul-Haq Shoaib Malik and Sarfraz Ahmed. Shadab Khan will be leading the spin department while Mohammad Amir Hasan Ali and Shaheen Afridi will take care of the pace department. Apart from India and Pakistan Hong Kong were also clubbed with the two Asian giants. They were previously the part of the Asia cup and will hope to do better than in 2004 and 2008. Batsmen Anshuman Rath will be on spotlight as he played 16 limited overs games and scored with an average of 52.57. Group B includes Afghanistan Bangladesh and Sri Lanka. In the opening match Bangladesh will face Sri Lanka. Both teams are struggling with the injuries of their key players. Bangladesh have three injured players --Tamim Iqbal Nazmul Hossain and Shakib Al Hasan --while Danushka Gunathilaka and Dinesh Chandimal were out from Sri Lanka squad but return of veteran pacer Lasith Malinga included some spark in the Sri Lankan squad. The third team which is grouped with Bangladesh and Sri Lanka is Afghanistan. 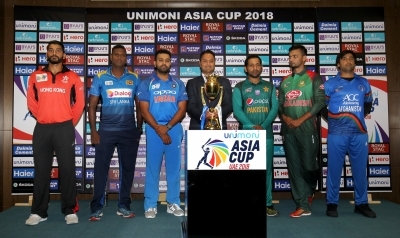 Last time they played Asia Cup is in 2014 where they crashed out in the group stages however they registered their first Asia Cup victory defeating Bangladesh. Afghanistan s improvement in the international circuit has increased over the years. With spinning star Rashid Khan in the squad along with Mujeeb Ur Rahman and Mohammad Nabi Afghanistan s bowling line-up will be a test for the others teams in the group.